Which battle are we fighting? I am incredibly sympathetic to market monetarism and feel that they have been consistently ahead of the curve. But identifyng a shortfall of NGDP growth expectations as being the primary reason for the recession, does not necessarily mean that a shortfall of AD is the current problem. 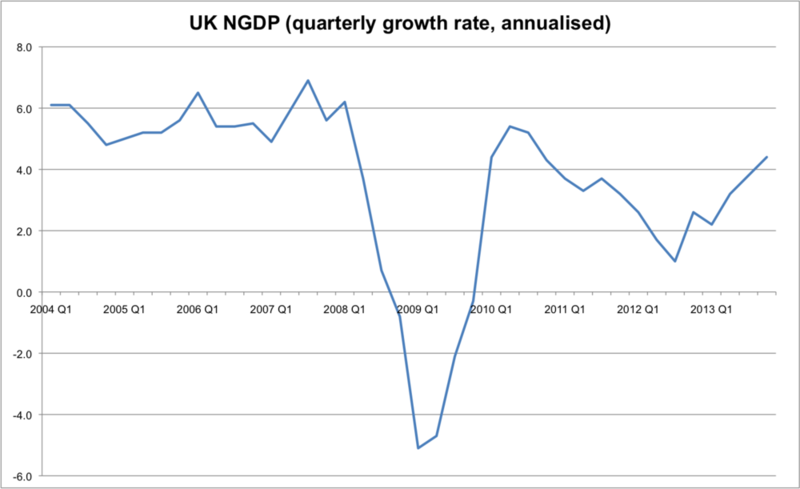 Obviously, the charts above leave us some way off where NGDP would be absent the recession. But as with most Austrians, I don't believe that this counterfactual is plausible. Even the most monetarist of market monetarists would agree that an NGDP growth rate of 500% is suboptimal, even if anticipated. Austrians think that the same applies (albeit to a much lesser degree) with one of 5%. 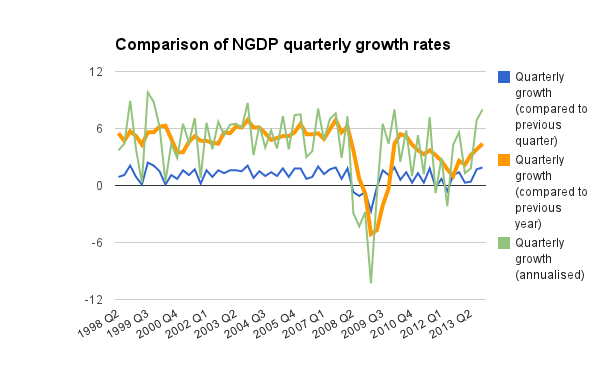 The chart below takes a longer look at what's been happening to NGDP (also QoQ of previous year): Clearly, the focus on inflation targets rather than collapsing NGDP was a major oversight by the Bank of England. We'd all be better off if monetary policy was more neutral during 2008, rather than being highly contractionary. What I'm less sure of, however, is the argument that monetary policy is too tight right now. The stable door is open. The horse has bolted. Optimal monetary policy would ignore past errors and guide NGDP expectations towards a sustainable growth path. A level target means that bygones are not bygones when shocks occur, for a given target. But since part of the debate is what an optimal NGDP level target would be, it's ok for market monetarists to be wary of loose monetary policy. P.S. 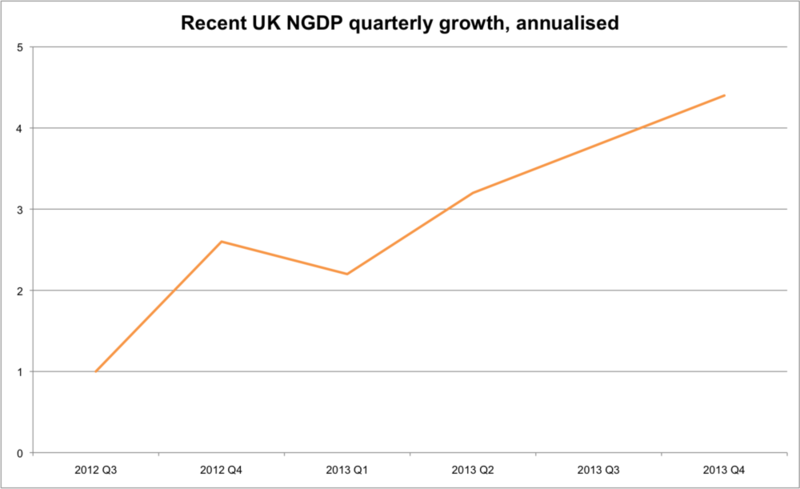 This post is focused on the UK economy. The argument that monetary policy is too tight in the Eurozone is a lot more convincing, and it's plausible that deflationary pressures may become a problem for the UK economy too. If it does, I will change my position.